The ancient sources and especially Strabo (1st century BC) were verified by the excavations and the discovery of the temple. Pausanias has also mentioned the establishment of a temple, which was dedicated to Apollo, Artemis and Leto, on the spot where Leto, being chased by infuriated Hera, untied her belt believing it was time to give birth. The temple of Apollo Zoster was discovered accidentally, in 1924, by the kids of the Orphan School of Vouliagmeni, while playing in the sand beach. Today, we can see the ruins of the temple at the beach of “Astir Vouliagmeni”. A huge Archaic cistern has been excavated 25 meters away from the temple. The temple was built in the end of the 6th century BC, in order to become the most important sanctuary of the ancient demos of Alos Aixonidae (modern Voula-Vouliagmeni suburbs). It comprises of a simple cella (Ι0,80 x 6 meters) and a “peristasis” (exterior colonnade) with 6 x 4 unfluted columns. The ruins of a rectangular altar are located in front of the temple. In the interior of the cella, are the 3 marble pedestals of the cult statues. Two of them bear the inscription “ΗΑΛΑΙΕΙΣ ΑΝΕΘΕΣΑΝ” (the Halians dedicated). The marble throne of the priest has survived together with a marble “table of offerings” which bears an inscription according to which a restoration of the temple took place, during the archonship of Polystratus (4th century BC). 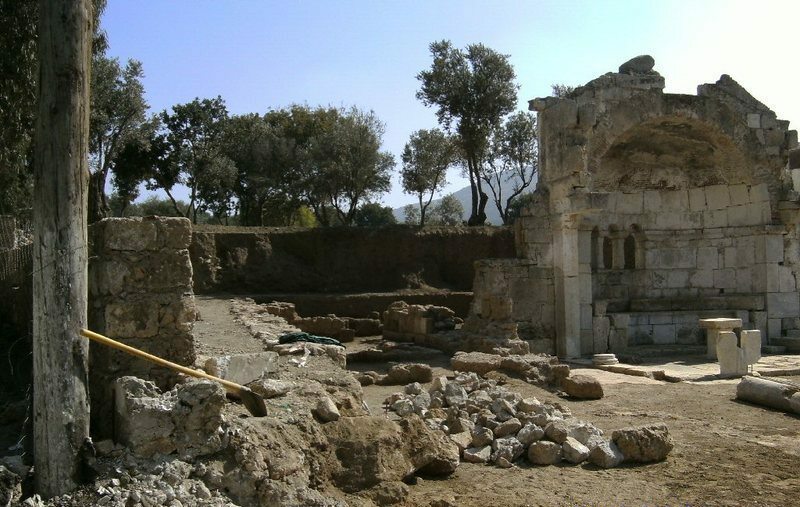 The ruins of the sanctuary of Apollo, at Daphni, are exposed, today, within the fortification wall of the renowned Monastery which is actually the Christian monument of the site’s long, continuous religious tradition. This sanctuary, together with others, on the ancient Sacred Road, was a major religious stop of the ancient Eleusinian Procession which the initiates followed, on their way from Athens to Eleusis. 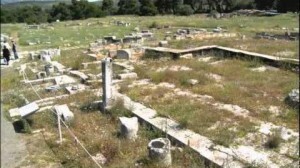 Pausanias visited the sanctuary, after his visit to the “Pythionike” monument, “on his way towards the west”, while following the Sacred Road. He reached the sanctuary of Apollo at Daphni, located “on the southern side of the Sacred Road on his left” as he mentions. The relation of the sanctuary with the Eleusinian Procession (dedicated to Demeter and Kore) explains the co-existence of the cult of Apollo with that of Demeter and Kore, in it. According to an inscription found in the theater of Dionysos, in Athens, Apollo was worshipped in the sanctuary of Daphni as “Daphnephoros”. It is assumed that there existed a temple dedicated to Apollo and housing the cult statue of both Apollo and goddess Athena. Additionally, the cult statues of Demeter and Kore must have been housed in a separate temple or sheltered stoa, an assumption testified by the great number of fragments of columns scattered around. The sanctuary was flanked by a peribolos wall, built of large, well cut blocks of stone which were used later for the construction of the Byzantine fortification wall of the Monastery, still visible today. The ruins of the ancient wall can be seen below the Byzantine one, on the northern side of the Monastery peribolos, today. Additionally, the huge, ancient stone threshold of the eastern gate of the Monastery is that of the ancient sanctuary. The temple of Apollo “Patroos” (of the ancestors) was built in the middle of the 4th century BC, at the western side of the ancient Agora of Athens, between the Stoa of “Eleftherios” Zeus and the Metroon building. It is a simple structure of a one chamber “sekos” (cella) and a “pronaos” (antae chamber), which was added in the Hellenistic years. A northern lateral-to-the-temple chamber may have served as an Adyton, most probably housing the cult statue of the god or the valuable offerings to him. The temple itself was built over the ruins of an earlier Archaic (6th century BC) one, in front of a pit used for the casting of a bronze cult statue, in the type of a “kouros”. As for the cult of Apollo, this was revived after the Persian Wars (5th century BC) when emphasis was given to the god’s ancestral aspect, since he was the forefather of the Ionians –the Athenians being Ionian in origin. On the other hand, the “omphalos” stones (Apollo’s stone symbols) that were found in the temple area refer to “Pythios” (of the oracles) Apollo of Delphi and the lateral chamber might indicate a double cult in this small temple. When Pausanias visited the Agora (around 150 AD), he saw 3 statues in the temple: one of them was a headless statue of Apollo “Kitharodos” (lyre player), in the type of “parendetikos” (dressed up with a feminine outfit), made by Euphranor and the other two were made by the sculptors Leochares and Kalamis. 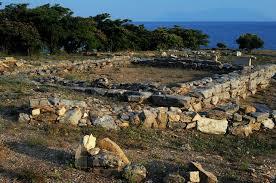 The archaeological site of Kolona is located on the NW of the island, near the port and the town of Aegina. The hill has been called “Kolona” (Column) by Venetian sailors for whom the column of the temple was an orientation sign. Kolona site is known for a pre-historic settlement (3rd millenium BC), found underneath the foundations of the temple of Apollo and the temple itself built, in the historic – Archaic years (6th century BC), over the ruins of the pre-historic settlement, at the time of the sanctuary’s prosperity. The Archaic temple of Apollo stands out, on a high level, within the ruins of the sanctuary. It is a Doric, peripteral temple with 11 x 6 columns, including a “pronaos” (antae chamber) and an “opisthodomos” (rear chamber). Today, the surviving ruins of the temple comprise of a monolithic column of the opisthodomos and the lowest part of the foundations. The altar is located on the eastern side of the temple while a small temple of Artemis has been revealed on the SE corner of the acropolis and a propylon at the south. Priests’ houses and two small rectangular structures are located further to the south. The walls of the sanctuary, which have survived, date from different eras, i.e. Archaic, Hellenistic and Roman. Here, below a rock outcrop of Mountain Ptoon, at a height of 225 meters, in a region called “Perdikovryse” and next to the chapel of Ayia Paraskevi, the temple of Apollo was built in the 4th century BC. The sanctuary comprised of the temple, the “mantic” (oracle) cave and the temple of “Pronaia” Athena. The temple of Athena was a symbolic small (4,30 x 6,70 meters) copy of the temple of Athena Pronaia of Delphi and was located east of Apollo’s temple. The Doric temple of Apollo, at the highest part of the sanctuary, was built in the age of Kassander (316 BC) of Macedonia and depended on Thebes. Very few fragments have survived from the earlier temple which was built on the same spot. A plethora of Archaic bronze offerings, like tripods, figurines and clay vessels have been brought to light. Their dedicatory function has been testified by inscriptions. A “cave-manteion” (cave-oracle) of the god functioned together with the temple, characterized as “polyphonon” (polyphonic) since oracular answers would be given in different languages. The cave comprised of a vaulted structure, in a depth of 5-6 meters, thus offering privacy. It functioned as an oracle for many centuries –one of the 6 oracles of Boeotia. The other 5 oracles were those of Trofonios in Lebadeia, of Thebes, of Amphiaraos, of Tegyra and of Abae. The cave was located south from the temple of Apollo and was supplied with the water of a nearby spring via a clay pipe. On the lower levels of the sanctuary, there were stoas, “xenons” (hostels), a cistern and the oracular spring. The inscriptions testify that the oracle of Ptoon was a spiritual center, protected by the confederacy of Boeotian cities, the so-called “Koinon of Boeotians”. 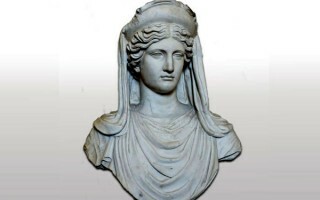 In the end of the 4th century BC, the “Koinon” included the cities Akraiphia, Anthedon, Chalkis, Koroneia, Aliartos, Lebadeia, Orchomenos, Oropos, Plataies, Tanagra, Thebes, Thespies and Thisbe. A little later, the cities of Yettos, Chaeronea and Kopes were added. The Koinon was governed by the representatives of the Boeotian cities and an executive board which comprised of the archons, the delegates, the eponymous archon and a secretary. The “Ptoia” festival was a spiritual contest, held every 5th year. An inscription of the 1st century BC informs us that there were contests for trumpeters, pronouncers, rhapsodists, epic poetry, athletics, and lyre playing. These contests were held in the nearby theater, most probably located in the northern parts of the sanctuary. The theater comprised of wooden seats around a circular orchestra. The altar “thymeli” was, as in all theaters, in the center of the orchestra. Bassae is located south of the Arcadian town of Andritsaina, on the western slopes of Kotylion Mountain and near the ancient city of Phigaleia. The mountain is scored with “vassai” (ravines), which give the place its name. In this bare, rocky landscape, 1.131 metres above sea level, the people of Phigaleia founded a sanctuary in honour of Apollo. A sacred road connected the sanctuary with the city, nearly thirteen kilometres away. The sanctuary was dominated by one of the most imposing monuments of ancient Greece: the temple of Apollo Epikourios. The temple of Apollo Epikourios, one of the most important and most imposing temples of antiquity, stands within the bare and rocky landscape of Bassae. It is unique in the history of ancient Greek architecture because it combines a variety of novel ideas both in its external appearance and in its internal arrangements. Indeed, Pausanias considered it to be among the finest temples of the Peloponnese in terms of sheer beauty and harmony, second only to that of Tegea (8, 41, 8). The building is dated in 420-400 BC and is believed to be the work of Iktinos, who succeeded in combining several Archaic, conservative Arcadian features with the features of the new Classical style. The surviving temple is not the first one to have been constructed on the site. The earliest temple of Apollo erected in the late 7th century BC, possibly at the same location, was rebuilt at least twice in approximately 600 and 500 BC (Archaic era). Many architectural features from these two phases survive, including a large terracotta “acroterion” (top roof tile) with ornate painted decoration, roof-tiles and antefixes. A Doric frieze of undecorated metopes and triglyphs ran along the outer facades of the upper part of the temple. Only the inner metopes of the short sides were decorated: those on the “pronaos” (antae chamber) had depictions of Apollo’s return to Olympus and those on the “opisthodomos” (rear chamber) contained the Capture of the daughters of the Messenian king Leukippos by the Dioskouroi. The pediments may have been undecorated. The temple’s main decorative feature was the marble Ionic frieze supported by the Ionic half-columns within the cella. This frieze was 31 meters long and consisted of 23 marble slabs, of which 12 depicted battles between Greeks and Amazons and the remaining 11 ones showed battles between Lapiths and Centaurs. The frieze was unearthed by foreign antiquaries in 1812 and sold to the British Museum in 1815. 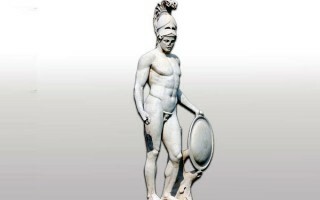 It may have been the work of sculptor Paionios, who had also executed the celebrated statue of Nike at Olympia. The temple remained in use into the Hellenistic and Roman periods, its roof being repaired several times. At the foot of Parnassos Mountain, within the angle formed by the twin rocks of the Phaedriades, the Pan-Hellenic sanctuary and oracle of Delphi lies “on the center of the world”. The two eagles of Zeus met here, while flying from the ends of the universe, in search of the “omphalos” (navel-center) of the world. The sanctuary of Delphi, set within a most spectacular landscape, was for many centuries the cultural and religious centre and symbol of unity for the Hellenic world. The temple of Apollo dominates the sacred temenos with its central position. This is where the statues and other offerings to the god were kept, and where the cult rituals, including that of divination, took place. Also, here was the “chresmographeion” (archive), which contained the lists of victors of the Pythian Games and which was destroyed in 373 BC. According to the legend, the first temple of Apollo was a hut made of laurel branches, the second of beeswax and feathers and the third of bronze, while the fourth was built by the legendary architects Trofonios and Agamedes who were inspired by Apollo. This was probably the stone temple that was destroyed, by fire, in the 6th century BC (548 BC). The fifth temple, which replaced the burnt one, was built with contributions of both Greeks and non-Greeks and was completed in the end of the 6th century BC (around 510 BC), by the Alkmaeonidae family of Athens. It was a Doric “peristyle” (surrounded by 6 x 15 columns) temple, with a marble façade and decorated with exquisite sculptures. The famous sculptor Antenor created the two pediments. The east pediment depicted Apollo’s Epiphany, himself being depicted in the center with his sister Artemis and his mother Leto, on a chariot –with the pediment corners being filled with male and female figures. Of the west pediment, which depicted the Gigantomachy, only the figures of Athena, a fallen giant, a male figure and two horses have survived. This temple was destroyed by the destructive earthquake of 373 BC. The priests received contributions, again, for a new one. The 6th new temple, whose ruins are seen in situ, was completed in 330 BC. 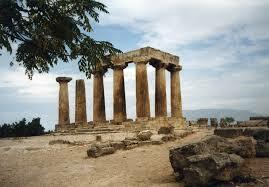 It is an imposing Doric temple built by the architects Spintharos from Corinth, Xenodoros and Agathon. It has the same plan and roughly the same dimensions as its predecessor, with 6 x 15 columns and both “prodomos” (antae-chamber) and “opisthodomos” (rear chamber) in antis. The “sekos” (cella) was divided into three naves by two colonnades of eight Ionic columns each. The divination ceremony took place in the inner shrine, called Adyton, an underground chamber where only the priests interpreting Pythia’s words had access. The pedimental sculptures were made of Parian marble by the Athenian sculptors Praxias and Androsthenes. The east pediment depicted Apollo and the Muses, and the west one Dionysus and the Maenads. Little is known of the arrangement of the temple’s interior. It has been testified by ancient writers that the walls of the pronaos were inscribed with sayings of the seven sages, such as “know thyself”, “everything in moderation” and the letter E. There was a bronze effigy of Homer and an altar of Poseidon, and, in the adyton, a statue of Apollo and the omphalos. The temple has been partially restored. Fragments of the pedimental sculptures of both the Archaic and the Classical/Hellenistic temple are displayed in the Delphi Archaeological Museum. The temple of Apollo, the emblem of ancient Corinth, today, stands on a flat rock, above the ancient agora. It is one of the earliest ancient structures that survived the total destruction of the city by the Roman general Mommios in 146 BC. Ancient Corinth was one of the cradles of early Doric temple building from the Geometric till the Archaic era (8th – end of 6th century BC). The first temple of Apollo was built in the 7th century BC, as it is testified by the scattered stone fragments and the monumental tiles found on the hill. It was built of stone, plinths and wooden beams and carried a heavy roof of clay tiles. Most probably, it was a simple structure without exterior columns. Its successor was built in the 6th century BC (560 BC) with an outer colonnade of 6 x 15 monolithic limestone columns. Its central structure was divided into three parts: a “pronaos” (antechamber) with two columns in antis, a central oblong, rectangular room subdivided into two parts (cella) and an “opisthodomos” (rear chamber) with two columns in antis. This temple testifies the economic and political status of ancient Corinth during the Archaic era when the city had the leading role in the colonization of west Mediterranean. Additionally, its form with the pediments and the clay sphinxes, at the corners, functioned as a prototype for many contemporary temples. On the temple’s ratios and its form, one can see the power of the Archaic era and the establishment of the “petrified” form of Doric temples. After the destruction of Corinth and its re-founding, a century later, in the Roman period, the temple of Apollo was renovated in order to house the cult of the Emperor. 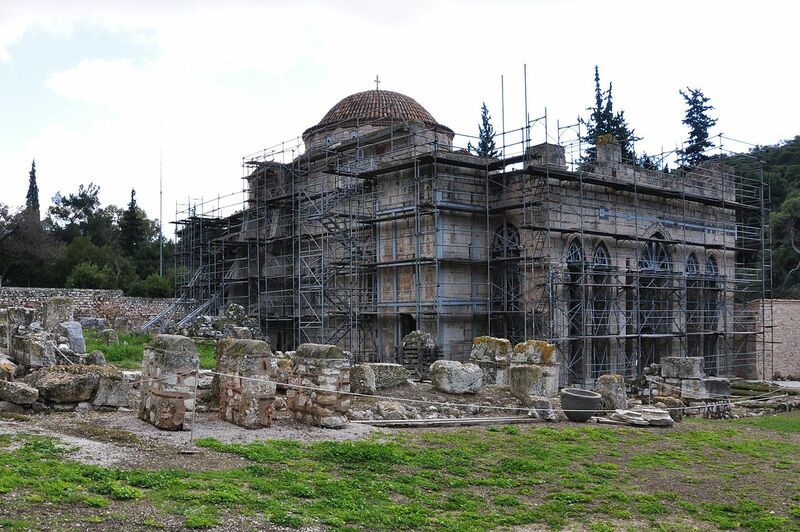 In the Byzantine era a basilica was built on the NE part of the Temple Hill, whereas in the Ottoman period, the eastern part of the Temple was demolished and the residence of the local Turkish Bey was built on top of its “crepis” (elaborate ground floor). Today, although only seven standing columns of the western “pteron” (surrounding colonnade) and part of the crepis and its foundations are preserved, the monument remains the emblem of the Archaeological Site of Ancient Corinth, and remains one of the few standing Archaic Greek Temples in the world. In the peaceful hinterland of Epidauros, with its mild climate and abundant mineral springs, the sanctuary of the god-physician Asklepios, the most famous healing centre of the Greek and Roman world, offers visitors the same serenity as once in its glorious years of prosperity. The area was devoted to the cult of healing deities since Prehistory, much before the introduction of the cult of Asklepios. 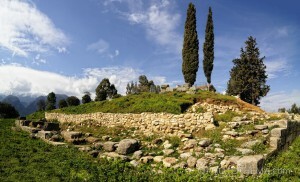 A Mycenaean sanctuary dedicated to a healing goddess stands on the Kynortion hill, NE of the Theatre. It was founded in the 16th century BC over the remains of a settlement of the Early and Middle Bronze Age (2800-1800 BC) and functioned until the 11th century BC. Unlike other sanctuaries of this period, this one is unusually large. This early sanctuary was replaced c. 800 BC by another, dedicated to Apollo, a god with healing abilities, worshipped here as Apollo “Maleatas”. The worship of Asklepios, the sanctuary’s main healing god, traditionally considered as the indigenous son of Apollo and the local, Epidaurian princess Koronis, was established in the 6th century BC. Asklepios, protector of human health and personal happiness, was a very popular deity with an ever-increasing number of worshippers. The sanctuary at Kynortion was quickly overwhelmed by a great number of visitors, so a new sanctuary was founded in the plain, approximately one kilometer NW of Kynortion Hill, on the site where, according to the myth, Asklepios was born. 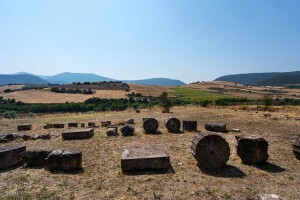 The two sanctuaries, one dedicated to Apollo Maleatas and the other to Asklepios, were subsequently known under the common name of “Sanctuary of Apollo Maleatas and Asklepios”. The Asklepieion at Epidaurus comprises of two sanctuaries dedicated to two healing gods: the earlier sanctuary of Apollo Maleatas on Mt. Kynortion and the later sanctuary of Asklepios in the plain, where the famous healing rituals took place. The smaller mountainous sanctuary of Apollo Maleatas was continuously occupied from the Early Helladic period (apsidal building) to Roman times. 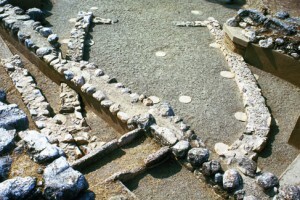 The three terraces of the Mycenaean temenos with its open-air ash altar and area for ritual feasting are still visible. Parts of the tufa foundations of the temple of Apollo erected in 380 BC over the ninth century BC ash altar and of the small Archaic temple of the seventh century BC are preserved on the lower terrace. A monumental tetrastyle altar was built in the Classical period east of the temenos. In the fourth to third centuries BC, during the sanctuary’s most important construction period, a terrace wall was raised along the sanctuary’s northern limits. This wall was lined by a portico facing south. An extremely rare small open-air sanctuary of the Muses dates to this period. The remaining visible monuments – that is, the propylon (entrance gate), the restored Hellenistic house of the priests, the basin of Antonine, of which a large part of the roof is preserved and a fountain – all date to the second century AD. The sanctuary of “Amyklaios” Apollo or of “Hyacinth and Apollo” is located 5 kilometers south of Sparta, on the hill of Ayia Kyriake (where the chapel of Ayia Kyriake is) at Amyklai. 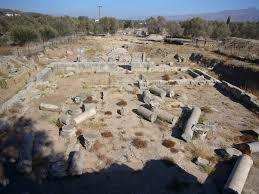 Much before the construction of the sanctuary, Amyklai was already one of the oldest cities of ancient Greece. Traces of a Middle Helladic settlement (2000 – 1600 BC) have been revealed during the excavations, together with many finds and lots of pits on the ground which holded house storage jars. The end of the 8th and the 7th century BC are marked by the first monumental phase of the site, with extended interventions on the hill: the ruins of the old city are put aside and are used both for the construction of a new peribolos wall and the filling of the ground. A flat area was created, ready for the new building. Amyklaion sanctuary gradually becomes the major political and religious center of Sparta, symbolizing the political reconciliation of Doric Sparta (god Apollo) with the earlier inhabitants of Amyklai (deified Hyacinthos). According to the myth, Hyacinthos was the younger son of Amyklas and Diomede, a very handsome young man, favored by Apollo. Apollo killed, accidentally, Hyacinthos at a discus-throwing contest. At the very spot where Hyacinthos’ blood dropped, a beautiful flowers sprout, thus called “hyacinth”. It was believed that the initials “YA” were naturally painted on the flower’s petals. 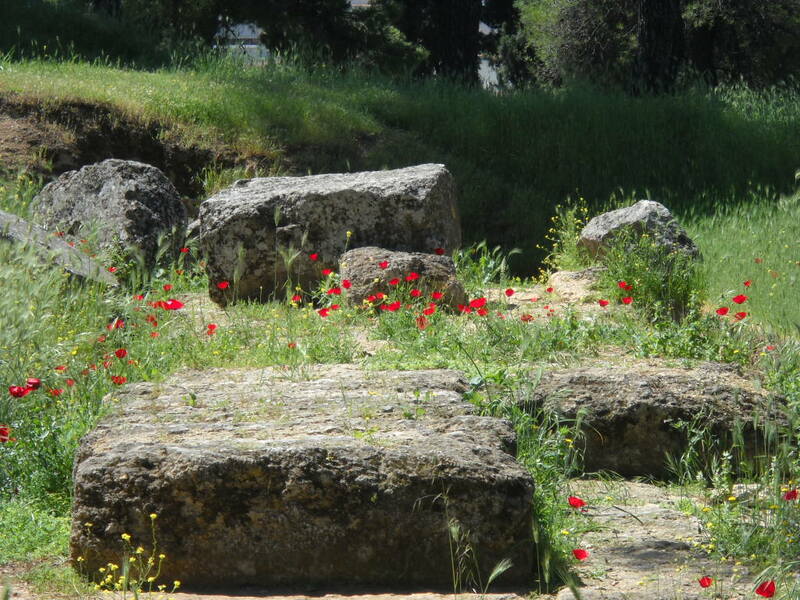 Hyacinthos was buried at Amyklai and, later, the “Throne of Apollo” was built over his altar. The “Throne” was a peculiar structure, comprising of stoas and chambers. The “Throne of Apollo” was enlarged in the 6th century BC and became a colossal kind of seat, in the center of which the column-like statue of the god would stand. Pausanias mentions that the statue was of a colossal size (around 14 meters). The statue was, actually, the old aniconic wooden representation of the deity, which was then plated with a bronze sheet by Bathykles sculptor from Magnesia of Asia Minor. The god was holding a sword and a bow and was wearing a helmet. The throne itself was the work of Bathykles as well: the seat was made of horizontal beams. At the façade, it is supported by 4 female columns. The lower and back parts were decorated by sculptural mythological scenes, i.e. representations of nymphs being kidnapped by gods, Perseus beheading Medusa, goddess Athena leading Herakles on Olympus, scenes from the tasks of Heracles. This structure comprised of stoas and chambers, as well, with an inner peristyle for the attendance of rituals around the tomb-altar of Hyacinthos, being at the same time the pedestal/base of the colossal statue of Apollo. There was a bronze door which gave access to the altar for the sacrifices. Bathykles combined the Doric simplicity with the Ionic elegance and created an excellent work, something obvious on the impressive mixt capitals of the columns. The xoanon-statue of the god projected, like an antenna, on the top of the hill, visible from the lower parts of the valley of Laconia. The “Hyacinthia” festival took place on the laconic “Ekatomvaea” month (July). It was a major religious festival for the Amyklaians, who would not miss it, no matter how far they were from home. Even during war, they would agree a month’s truce, so as to return home for the festival. The 3-day festival included two days of mourning with light meals and purification rituals and a day’s festivities with feasts, contests, sacrifices and the dedication of a chiton (cover cloth) to Apollo, woven by the Spartan women. The ceremony of the “dedication of the chiton” started with the procession through the “Hyacinthia Odhos” (Hyacinthian Way) which connected Sparta with Amyklai. Today, one can see traces of a retaining wall, a terrace, precinct walls, some foundations and a circular altar. The architectural fragments of the mixed Doric and Ionic style are displayed in the Archaeological Museum of Sparta. The ancient city of Argos was built on the foot of Larisa acropolis Hill. A second acropolis hill, near Larisa, is the so-called “Aspida” or Prophet Elias (modern name). The ancient city of Argos was built at the foot of Larisa. According to the ancient local tradition, goddess Athena had hidden her shield (“aspida”) on a hill which took the name “Aspida. The sanctuary of Apollo “Deiradiotes” or “Pythios” was built in the 6th century BC, on the saddle, between the two acropolises, the so-called “Deiras” (saddle). Pausanias (II 24,1-2) mentions a temple of Apollo, built by the Delphian Pytheas and a bronze statue of the god which stood inside the temple in an upraised position. He mentions the existence of an oracle there, functioning once a month, where the priestess Pythia, before giving the oracular, drinks from the blood of a sacrificed goat. The surviving parts of the sanctuary are a monumental staircase and an altar. The ruins of a byzantine basilica are visible SE of the altar. Further to the east, on a terrace, there is a rectangular hypostyle structure, perhaps an oracle and, on a third terrace, the foundations of another structure can be seen, housing a cistern, perhaps an Asclepion. On a lower terrace, in the south, the traces of a tholos can be seen, perhaps the sanctuary of goddess Athena. The cult in the site is testified from the Archaic era (6th century BC) but the surviving traces date from the 4th century BC. The cult continues in the Christian era with the construction of successive basilicas. Today, the monumental staircase and the open area, in front, are used for cultural performances. The sanctuary is located 700 meters NE of Kalapodi village, opposite the church of Ayioi Apostoloi, on the National Road Atalante – Delphi. It was traced by the German Archaeological Institute and, according to ancient (Herodotus VIII, 33) is among the most important sanctuaries of the area. 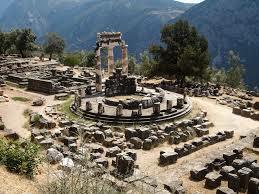 The site has been identified with the cult center and oracle of Apollo of Abae, a tribal sanctuary with a great fame. From the early Archaic era (7th century BC) the center of the sanctuary is occupied by two parallel temple structures, known by the excavators as north and south temples. The north temple has been identified by Felsch as the temple of Apollo, while the south temple as the temple of “Elaphebolos” Artemis. Here, we have a continuous religious activity for 1.500 years, starting with Mycenaean traces and ending with a structure from the age of Hadrian (2nd century AD). The beginning of the cult goes back to the Mycenaean era (15th century BC). Later and over the ruins of the Mycenaean shrine, an important Geometric (9th – 7th century BC) sanctuary was built, comprising of two temples, an altar and an open court, in front, for the rituals. The south temple was actually built over the ruins of the Mycenaean shrine and was dedicated to Artemis, while the north temple, with an “eschara”-altar was built on “new” ground and was dedicated to Apollo. The eschara-altar indicates chthonian (oracular) rituals. According to the excavators, here at this sanctuary, the cult of Apollo is introduced for the first time. These temples were enlarged in the beginning of the 7th century BC and belong to the first “prostyle” temples in Greece. They functioned until they were burnt down by a fire, in the beginning of the Archaic era (6th century BC). Soon after the fire, the temples were restored, in the same age (Archaic). It was actually after the victory of the Phocaeans (A’ Sacred War, 560 BC) that it was decided to create the center of worship of Phocis here and celebrate the “Elaphebolia” in honor of Artemis. For this reason, they covered the earlier temples with earth and created a flat surface for the new temples: two peripteral temples, parallel to each other. The northern one was dedicated to Apollo (44,50 x 14 meters and 18 x 6 columns). The southern one was smaller (26,28 x 13,62 meters and 11 x 6 columns). Both temples comprised of mixt wooden and stone columns and their walls were made of raw plinths, covered with plaster, while their roofs comprised of a wooden structure covered with thick tiles. The Archaic sanctuary was burnt down by the Persians, after the Battle of Thermopylae (480 BC). After the end of the Persian Wars, it was decided to build just one classical temple over the ruins of the previous ones, in the southern side: this temple was dedicated to Artemis. Over the ruins of the northern temple, it was just an altar that was placed: it was actually a low mount of clay that was placed with a pillar to serve as a table of offerings. This table carried a temporary bust of Apollo, instead of a cult statue. This classical altar of Apollo is a unique discovery in Greece, since it was found intact, with all the equipment of the last ritual like rings, pins, a big spit, a clay female mask and a unique bronze kouros dated from 500 – 490 BC and created in a local workshop. The classical temple of Artemis was destroyed by the serious earthquake of 426 BC. The temple was rebuilt according to a new architectural plan, which shows …επιρροές from the Parthenon and the temple of Apollo at Bassae. The temple of Artemis was ready in 400 BC, but the date of its destruction remains unknown. It was a peripteral Doric temple (45,80 x 19,26 meters and 14 x 6 columns) with a pronaos, cella with an Adyton and an opisthodomos, with a total of 520 drums. Its construction started in 426 BC (right after the earthquake) and its plan was based on the principles of the Athenian architecture school –Iktinos could have been its architect. Pausanias mentions that the temple would open only twice a year, for the “Elaphebolia”, the ancient festival and, probably, for the “Kaisareia”, which, at his time, was a great festival in which Roman emperors participated. At the end of antiquity, the Egyptian gods Isis, Osiris and Anoubis were worshipped, as well, in the sanctuary. These cults have been testified dedicatory inscriptions of the 3rd century AD. The sanctuary was abandoned during the reign of the Byzantine emperor Theodosius A’ (4th century AD). It was looted by fanatic Goths and later during the Christian era. The excavations have brought to light a plethora of finds. From the layer of the Persian destruction, we have dedications of 8 chariot wheels and a bronze decoration of a scepter in the form of a ram-head. From the earlier buildings of the south Archaic temple, we have fragments of frescoes of the 7th century BC, a total of 13 swords and 5 spear heads of the 8th century BC and a bronze “phiale” (plate-like vessel), from N Syria, among others. A painted Mycenaean crater is of the important finds. 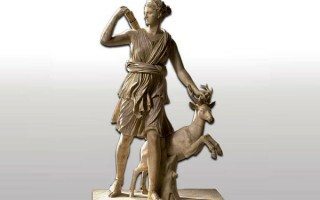 “Elaphebolia” was the ancient Greek festival in honor of Artemis “Elaphebolos” (she who hits the dear). The 9th Attic month “Elaphebolion” (February – March) got its name from this festival. The festival took place on the 6th day of the month, in many regions in Greece. From the little information that we have, we know that during the festival, sacrifices of deer would take place. Most probably, in later years, these sacrifices were replaced by delights, in the form of deer, made of flour, honey and sesame. Plutarch mentions that the Elaphebolia was the greatest festival of the ancient town of Hyambolis in Phocis, which was celebrated in commemoration of a victory in the battle of the inhabitants against the Thessalians. 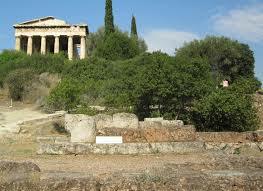 He also mentioned that there was a temple dedicated to Artemis, in the town. The temple of Apollo Daphnephoros is the most important and widely known monument of Eretria. Together with its enclosure, it constituted the sacred temenos of Apollo, a religious centre and fundamental place of worship, within the core of the ancient city, to the north of its Agora. According to the Homeric hymn to Apollo, when the god was seeking for a location to found his oracle, he arrived at the “Lelantion Pedion” (Lelantine plain). The first temple is dated from the Geometric period and was situated probably near the harbour, as the sea, at that time, reached the Agora. The “hecatompedon” (100 feet long) apsidal edifice is the earliest in its type among those mentioned by Homer, and slightly posterior to the hecatompedon temple of Hera on the island of Samos. 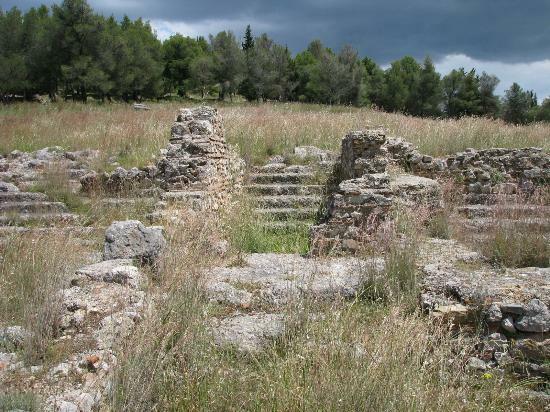 It was flanked to the south by another earlier, apsidal building which also came to light: the so-called “Daphnephorion” (7.5 x 11.5 meters) is the most ancient edifice in Eretria, related to the early cult of Apollo in Delphi. At the centre of this edifice, the clay bases, which supported the laurel trunks, have been preserved. The laurel trunks, on their turn, supported the roof of the Daphnephorion. In the early 6th century BC, a second hecatompedon temple was erected through earth fills upon its Geometric predecessor, on a solid artificial terrace. This temple comprised of wooden columns (6 x 19) and was subsequently covered with earth in order to build the later and most renowned of all temples in the city. The construction of the renowned temple started in 520 – 490 BC and it was perhaps still unfinished when the Persians razed the city in 490 BC. Poros stones and marble were the materials used for this Doric peristyle (surrounded by colonnades) temple (6 x 14 columns). It had a prodomos (anteroom) and an opisthodomos (back section) arranged with two columns in antis; the cella (in Greek sekos) was divided into three parts by two interior colonnades. After the destruction of the city by the Persians, the temple was repaired and remained in use; yet in 198 BC it was destroyed again, this time by the Romans, a fact which initiated the gradual abandonment and dilapidation of the monument until the first century BC. The majority of architectural parts from this temple were re-used as construction material; only a few (column) drums together with fragmented capitals and triglyphs remain from the superstructure of the monument. Of the sumptuous sculptural decoration survive only parts of the west pediment featuring in relief the fight of the Amazons (or Amazonomachy, a usual motif for the iconography at the time). The centre was occupied by Athena and is partially preserved, depicting her trunk with the “Gorgoneion” on the thorax; a superb work of art is the complex of Theseus and amazon Antiope marked by sensitivity and softness of the form, internal force and clarity, despite the ornamental tendency obvious in the coiffures and the folds of their clothes. The temples of Apollo on Delos Island were built on a low terrace, next to the water, within the sacred precinct of Apollo. The first temple of Apollo was built in the 6th century BC: a rather small but imposing structure in the simple Doric style with a colonnade, made of local porus stone. A huge cult statue of Apollo, made of a wooden core and sheets of gold and created by the sculptors Tektaios and Agelion, stood inside the temple. The second temple of Apollo, south of the first, was built after 478 BC, when the sanctuary was under the Athenian dominion. It was a Doric peripteral temple with columns in antis, on both sides. This temple remained unfinished: its construction stopped on the level of the entablature, in 454 BC, when the treasury of the allies was transferred from Delos to Athens. The temple was finally concluded after 303 BC. Many traces of shelves were discovered inside the temple, used for the placement of dedications and which made it look like a treasury house. A third temple dedicated to Apollo was established by the Athenians, in an attempt to propitiate the destroyer and, at the same time, redeemer god. It was the time of the great plague (429 and 427/6 BC). The Athenian temple was raised between the earlier two (the old porus temple and the unfinished one) and was made of Pentelic marble. The whole structure indicates Kallikrates, the architect of Parthenon. The interior was formed in such a way, so as to house a composition of 7 big statues on a semi-circular pedestal (“the house of the seven”). The wooden ceiling panels of the temple were placed at the inclined inner sides of the pitched roof, forming pediments over the inner walls. On top of the temple, the magnificent akroteria: on the western one, goddess Eo raises Kephalus on the air, while on the eastern one, Boreas (northern wind) grabs nymph Oretheia, the daughter of the mythical king of Athens Erechtheus. 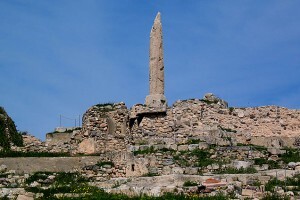 The archaeological site of Portara is located NE of the modern harbor of Naxos town. 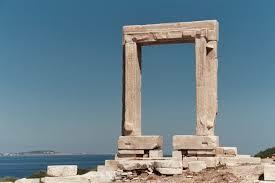 It presents the most imposing “Porta” (gate) in the Cyclades, called “Portara” by the locals, at an area called Palatia. 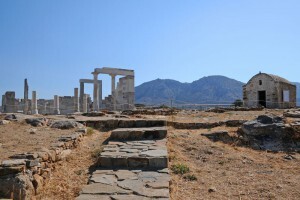 The Portara (54 x 28 meters) was the gate of the temple dedicated to Apollo, at the islet of Palatia, being connected today with the town by a modern paved walk way. From the mythological background of the islet, we know that this was the spot where Theseus abandoned Ariadne, after the killing of the Minotaur, on his way back to Athens. It was here, where god Dionysos found her and took her with him. Built in the 6th century BC, it comprises of 4 monoliths of Naxian marble, over 6 meters long each and of approximately 20 tons of weigh. 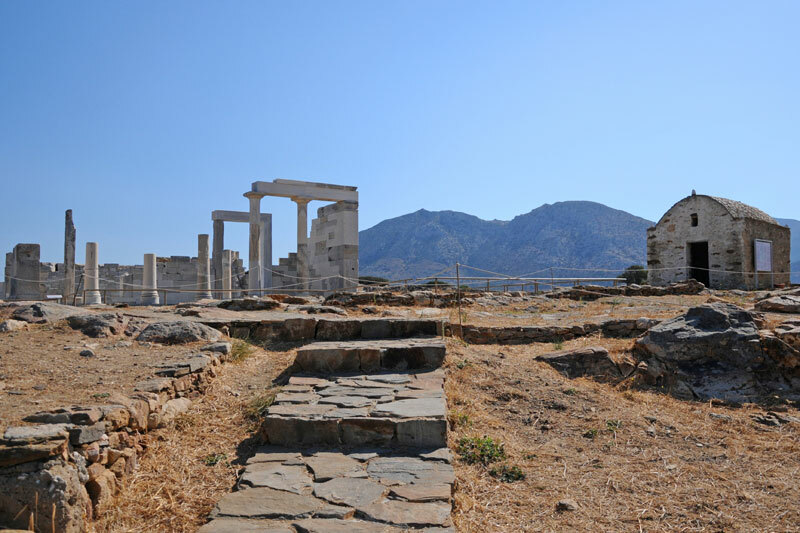 The construction of the temple started at around 530 BC, by Lygdamis, the tyrant of Naxos, but was never finished. Lots of stories, created by local imagination, were born out of this fact. 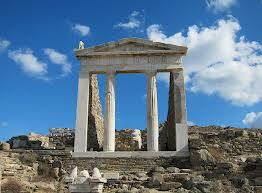 The temple was oriented towards the sacred island of Delos. The temple was converted into a Christian Basilica, during the early Christian years and suffered quarrying many years after, by the Venetians who used it for the construction of the castle. The sanctuary of “Napaeos” Apollo is located at the rural area called “Klopedi”, north of the Gulf of Kalloni and very close to Ayia Paraskevi village, on the island of Lesvos. Here, we have the ruins of two temples of the Archaic era. The temples, known as A and B, were built on a terrace of a low hill and indicate the cult area of which surface ruins are scattered around. This sanctuary is the oldest found on the island of Lesbos and comprises a unique example of the so-called Aeolic style in architecture. The building material comes from the nearby ancient quarry of Petsofas. The traces of the road connecting the sanctuary with the town of Arisbe are still visible. 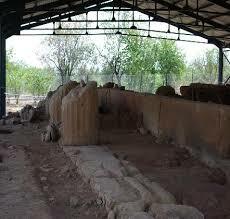 The earlier of these temples is Temple Α (29,20 x 18,70meters), dated from the Archaic age. The finds indicate a pronaos (antae chamber), main temple and opisthodomos (rear chamber), surrounded by a “pteron” (exterior colonnade). Temple Β is located a little further to the north, built on the natural flat bedrock. Its stylobate has survived, with the bases of 2 columns on its NW corner. This is an indication of a “pteron” (exterior colonnade) of a total of 46 columns. 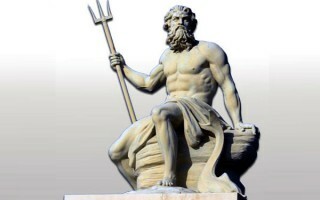 The worshipped deity, here, has been identified with the well-known “Napaios” Apollo from the ancient sources. The finds confirm this: a clay slab with the inscription «..ΛΩΝΟΣ» (of Apollo), found in the foundations of Temple A and a part of a bronze kouros figurine, from the cult pedestal of Temple B. The sanctuary of Delios Apollo which is located between the villages of Chorio and Panormos of the island of Kalymnos had been the political and religious center of the island throughout antiquity. Lots of religious and secular buildings have been found in the surrounding area, like temples dedicated to both Apollo and Asclepius, a theater, a council house, a gymnasium, inscriptions, dedications, statues of gods and mortals, dating from the 4th and 3rd century BC. A plethora of portable finds, like figurines, inscriptions and bases of statues, indicate the continuous use of the site as a sanctuary from the beginning of the 1st millenium BC until the early Christian era. 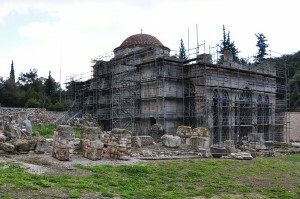 Today, the dominant features of the site are two early Christian Churches, built in the 5th and 6th century, dedicated to Christ of Jerusalem and Ayia Sophia (Holy Wisdom), accordingly. The Archaic temple of Apollo is located at “Lianokokkala”, 12 kilometers W of Karditsa town and 2 kilometers W of Metropolis. Here, on a terrace, S of the course of river Laparda (or Gavria), on the right hand side of the road, leading from Metropoli to Koronas Monastery and lake Plastira, Apollo was worshipped. This location belonged to territory of ancient Metropoli which was an important civil center of Thessaly, during the Hellenistic Age, still buried under the modern village. The excavations in the site brought a peripteral, Doric temple to light, with an interior colonnade. Judging from the typology of the capitals of the columns, the roof tiles and the cult statue, the temple has been dated from the middle of the 6th century BC. A rectangular pedestal, belonging to the cult statue, was found in the middle of the main temple (sekos), in front of the third column of the inner colonnade. 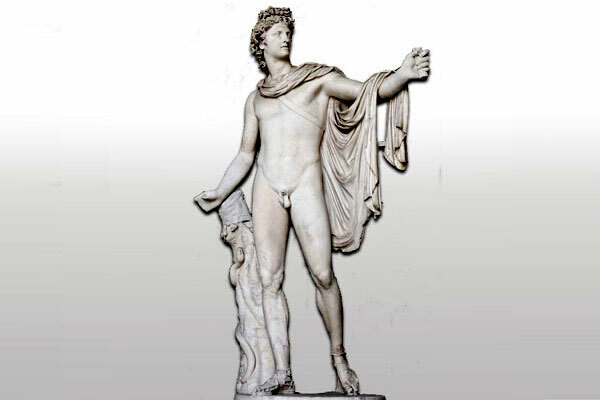 The bronzed statue of Apollo, in the form of a “hoplite” and broken in three pieces, was found on the pedestal, on its original position where it stood for ages. Its height is 0,82 meters and dates from the 6th century BC. He is wearing a conical helmet, a breastplate, armbands and greaves. The position of his hands indicates that he was holding a spear with his right hand and perhaps a bow with his left hand. The upper part of the spear has been found as well. 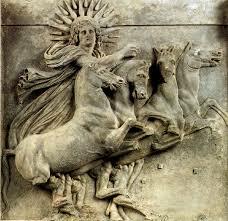 The cult of god Apollo (called “Aploun” in the Thessalian dialect) was very popular in the area of ancient Thessaly. 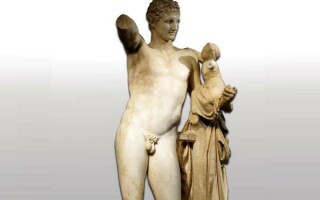 The identification of the bronze statue with god Apollo was confirmed by the discovery of an inscribed dedicatory stele of the 4th century BC, which was found in the temple. The representation of the god as a hoplite is very rare. Furthermore, the coin representations of ancient Metropolis confirm the cult of Apollo in the town. The sanctuary of Apollo which is located in the center of the ancient agora of Gortys was excavated in 1887. This was the most important religious center of the city, before Christianity and the erection of the Basilica of Saint Titus in 500 AD. The first structure of the 7th century BC was a 4-sided sekos with four wooden columns in the center, supporting the roof. The exterior walls and the steps of the crepis were all covered with Archaic inscriptions. During the Hellenistic era, a monumental pronaos was added to the temple, together with inscribed stelae, among the columns. Some restorations and additions took place during the Roman times, like the small theater which was built on the western side. At the final phase, during the middle Byzantine years (around the 11th century AD), houses and aqueducts were built over the ancient ruins. An important sanctuary, dated from the Archaic to the Hellenistic era, has been excavated on the peninsula of Athos, SW of New Roda. Up to now, two buildings have been brought to light and a third one is being excavated. The sanctuary was established by the inhabitants of Sane, which was a colony of the island of Andros. A fragment of an inscription, dated from the 5th century BC, indicates the ….όρια of the sanctuary. The prosperity comes in the Hellenistic years when Alexander, Kassander’s brother, builds the city of Ouranoupolis in 315 BC and incorporates the sanctuary into it. He restores the old buildings and builds new ones. The first building is dated from the Archaic era (6th century BC). It is an “oikos” (sacred house) with a sekos and pronaos in antis, raised on a pedestal (1 meter), decorated with …… κυψελωτό motif on the exterior of its limestone walls. The roof of the oikos is very interesting with its clay, Corinthian tiles and the Nike …acroteria. These Nikes are excellent examples of late Archaic sculpture with few parallels from southern Greece, i.e. 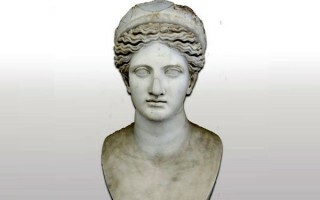 Olympia. The second building is a temple dated from the Hellenistic era. It comprises of a pronaos and a sekos with three entrances, a built bench, a table of offerings and a hearth in the middle. The most interesting finds are two marble heads of god Helios and a woman, found near the eastern entrance of the sekos, a clay altar with painted decoration and a unique clay vase with six sides (hexahedron). Ambrakia was an ancient city-state of W Greece, built by Arachthos river at the location of contemporary Arta. The important temple, dedicated to Apollo “Pythios-Soter” and built in the middle of the ancient city, is located today in the center of Arta, at Kilkis Square. It is dated from in 500 BC, a chronology based on the porus architectural members, found scattered around. There must have been older shrines to Apollo in the same area though. The temple must have functioned as archive since a public record, of the 2nd century BC, has been found, comprising of an inscribed stele with the text of a decree, determining the boundaries between Ambrakia and Charadros after the Roman conquest. This document provides essential information regarding the management of the ancient cities of Epirus. 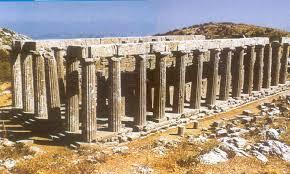 The magnificent temple was Doric, peripteral with an elongated sekos (44 x 20,75 meters). 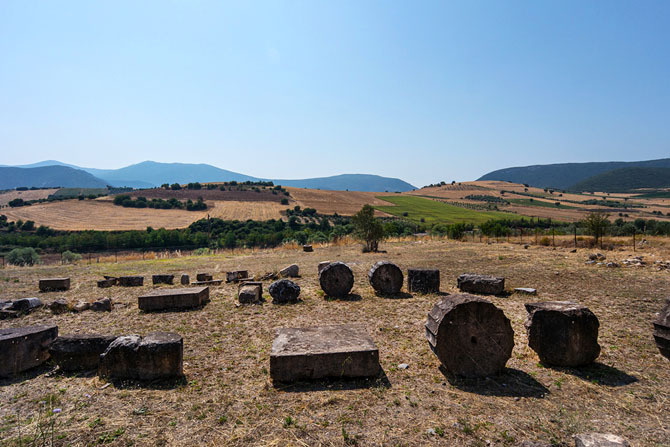 At the back of the sekos, the foundations of the pedestal of the cult statue of Apollo have been preserved. 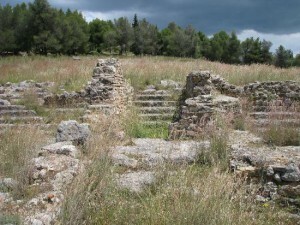 From the temple itself, the krepis (floor) and foundations have been preserved. The monument served as a quarry in the early Christian era and, a little later, as a cemetery. At the SE coast of Thrace, between Ismaros and Evros, in the end of the 7th century BC, Greeks from Samothrace built a chain of fortified cities, called “Samothracian Walls” by Herodotus. These colonies which comprised of the “Peraia” (opposite coast-land) of Samothrace became very important: a land which controlled the passes from east to west gave access to the hinterland and offered urban services and imported goods to the growing elite of the Thracian kingdom of Odryssae. It had been a key choice, which contributed to the Hellenization of the Thracians and brought wealth to the land, as testified by the finds of the excavations at ancient Zone. Ancient sources mention Mesemvria, Dry, Zone, Sale and, later in the Roman era, Tempyra and Charakoma. Ancient Zone was the most important and thriving colony of Samothrace. The city had grown on the southern slopes of a low hill, at the foot of Zonaia, reaching the sea and was surrounded by a fortification wall. At the “insulae” (residential quarters), we recognize the characteristics of the typical Greek house of the 5th and 4th century BC. Aphrodite, Dionysos, Demeter and Apollo were worshipped, in the town. Up to now, two sanctuaries have been found: the smaller one, dedicated to Demeter and the other one, dedicated to Apollo. 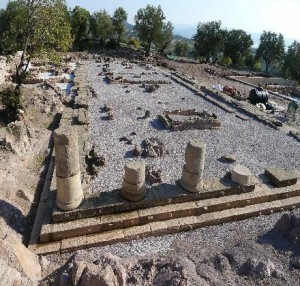 The temple of Apollo is the most important public building of ancient Zone, within the only Archaic sanctuary identified with Apollo in Thrace. The temple (9 x 15 meters), with an orientation N-S, has survived on the level of the foundations with its 3-stepped “crepis” (floor) in the south. The surviving clay architectural fragments testify its Ionic style dated from the late 6th century BC. It comprises the basic structure of a comparatively large sanctuary (65 x 105 meters) for the size of the city. The foundations of the peribolos wall of the sanctuary are still in situ. The identification of the temple with Apollo’s cult is based on a plethora of sherds (around 300) bearing the name of the god, found inside and around the temple. These sherds together with 5 stone inscriptions –one of them is bilingual- give us valuable information for the local Thracian dialect. They are inscribed with Greek letters which form a dialect, relative to the Greek language. Despotiko, today, is an island, totally separated from nearby Antiparos by a narrow and shallow sea channel. 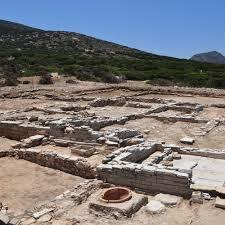 The archaeological site is located opposite Saint George of Antiparos, at a location called “Mandra” which is being systematically excavated by the archaeologist Giannos Kouragios, since 2001. An extensive sanctuary, dedicated to Apollo, has been brought to light. The existence of this sanctuary was unknown due to the lack of inscriptions or ancient sources. Its prosperity is dated from the 6th century BC although the earlier traces of worship go back to the 8th century BC, at least. Up to now, 12 buildings and a dining room have been revealed, together with the Archaic temple. Artemis and goddess Hestia were worshipped in the sanctuary, together with Apollo. The plethora of finds testify the wealth of the sanctuary and its contacts with the mainland of Greece and the Orient: fragments of at least 60 marble kouros statues, kore statues, elaborate vessels, ivory objects, jewelry, figurines and other.